Environmental and Outdoor Water Sources Kit plus Bacteria tests lakes, creeks, ponds, rivers etc are tested for basic chemical parameters, plus Bacteria Growth Indicator. 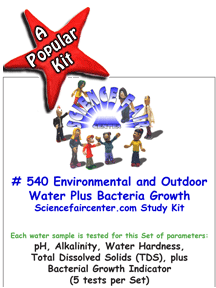 Environmental and Outdoor Water Sources Kit plus Bacteria. Good experiment for science fair project that combines chemical and bacteria testing. Chemical testing only takes a few minutes per sample. The bacteria sample grows for 2 days before reading. # 540 Environmental and Outdoor Water Source, plus Bacteria Growth. Each water sample is tested for this Set of parameters: pH, Alkalinity, Water Hardness, Total Dissolved Solids (TDS), plus Bacteria Growth (5 tests per set). Contact Us at: info@sciencefaircenter.com Please email us your questions and mention something about the students project, grade level, your question and if you want us to call…phone number. This pH test is very versitile in that it can be used for Drinking Water testing, food processing, environmental applications or in any other water matrix. pH is short for “Power of Hydrogen”. The balance of positively charged and negatively charged hydrogen ions in drinking water determines pH. Water that has a low pH is acidic or aggressive and can corrode plumbing resulting in metal ions being present in drinking water and damages fixtures and pipes. Water that has a high pH is basic and will leave scale in pipes and fixtures. This test features two test pads both measuring at the same range using different color indicators. This makes color matching easier on the Color Comparator Chart than with other colorimetric tests. Results are obtained from this test in 1 minute. Total Alkalinity is a fundamental parameter and water testing. Total Alkalinity indicates the buffering capacity of natural waters. A water is said to be buffered if the pH is not changed greatly by addition of acids or bases. The most effective buffering action is within the pH range of water from near 6.0 to about 8.5. Most natural waters are buffered to some extent by reactions that involve Dissolved Carbon Dioxide (CO2). This Carbon Dioxide is an indispensable reservoir of carbon for photosynthesis. Thus, the productivity’s of water can be correlated with alkalinity and the buffering system. The Color Comparator Chart for this test allows you to read Total Alkalinity in mg/L or ppm. 0, 40, 80, 120, 180 and 240 mg/L or ppm. Results are obtained from this test in 30 seconds. Water Hardness is composed of mostly calcium and magnesium. The water hardness comes from naturally occurring minerals in the local and regional geology being dissolved by water. contribute to corrosive water. High Hardness (Hard water above 400) can lead to clarity and scaling problems. Water softeners are used to reduce Total Hardness of water. Testing for hardness in tap water is very common and is very quick and easy with these test strips. The Color Comparator Chart for this test allows you to read Total Hardness in mg/L or ppm. 0, 40, 80, 120, 180, 250, 425, 1000 mg/L or ppm. Results are obtained from this test in about 5 seconds. Total Hardness (TH) is a measure of the total amount of calcium and magnesium that has naturally leached into the water during its journey through the watershed. In the U.S. water hardness is most often reported as milligrams per liter (mg/L) or parts per million (ppm) as calcium carbonate (CaC03). It is difficult to produce soap suds in water with high levels of calcium and magnesium ions, hence the term “hardness”. In addition to reducing the effectiveness of soaps and detergents, hard water may cause an insoluble scale to form on fixtures and on the inside of pipes. Scale formation depends on several factors, one of which is pH. Testing for Total Dissolved Solids (TDS) in water is very common and is very quick and easy with these test strips. The color chart for this test allows you to read TDS in milligram/L or ppm. 0, 50, 100, 250, 500, 750 mg/L or ppm. (Note: concentration units are milligrams per Liter or parts per million). Results are obtained from this test in about 30 seconds. 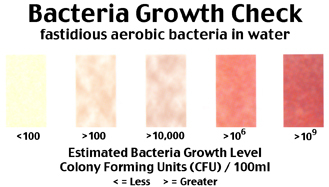 Bacteria Growth Check is a test strip that has been specially formulated with Brain Heart Infusion media that allows maximum cultivation of fastidious aerobic bacteria found in some waters. This test could be used in a variety of applications, however it is not specific for any particular type of bacteria. You can dip these strips in water or swab surfaces with them. The Bacteria test procedure then requires you to return the test strip into a clear plastic bag for incubation. After 48 hours of room temperature incubation, any fastidious bacteria on the test pad will multiply and turn the test pad pink to red. The darker and more consistent the test pad, the more bacteria that are present. Bacteria Growth Check tests only a small water sample and requires a significant quantity of bacteria to show a change on the test pad. Outdoor water source such as lakes, creeks, ponds, rivers etc are tested for basic chemical parameters, plus Bacteria Growth Indicator. Good experiment for science fair project that combines chemical and bacteria testing. Chemical testing only takes a few minutes per sample. The bacteria sample grows for 2 days before reading.